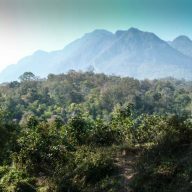 Chiang Dao in Northern Thailand is my favourite spot around Chiang Mai. I have been there a couple of times, just to chill out. 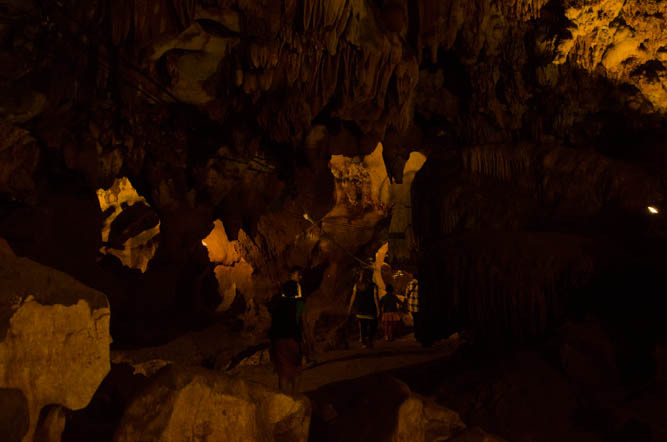 The area has some good trekking routes, beautiful views on the mountains and nice places to chill out, but the most popular attraction in Chiang Dao are the Chiang Dao Caves. 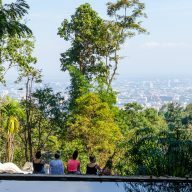 Bangkok Post claims it to be the top tourist destination in Thailand, but whenever I go there, there are only a few visitors around. It’s a shame that the caves are so unappreciated. It is a truly remarkable place. 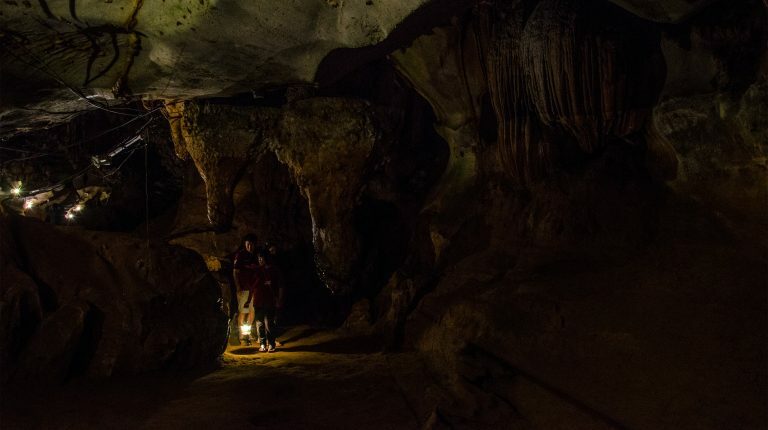 The caves stretch for 12 km under the Doi Chiang Dao Mountain, but there is only a small part of it available to the visitors. 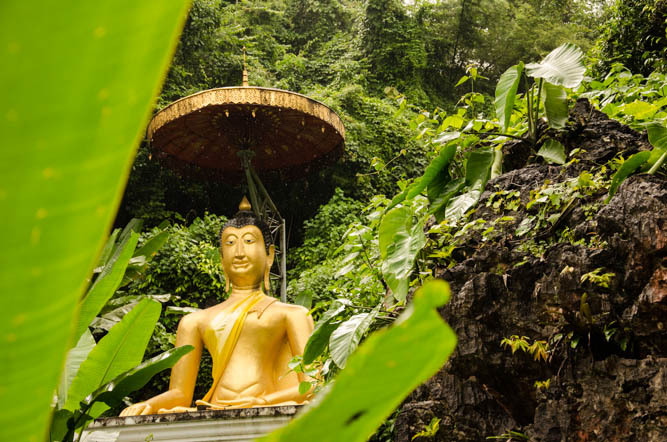 The local legend says that the caves were once home to a hermit, who managed to convince the angles to create some wonders in the caves: A stream flowing form a pedestal of a gold Buddha statue, a storehouse of beautiful textiles, a city of naga, a divine elephant and a tombstone for the hermit. It is said that these miracles live deeper inside the caves, under the mountain, but no one has every witnessed them so far. 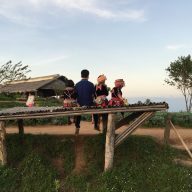 Nowadays, there is a small shrine built for the hermit, where the locals come to pray. The caves are famous for their crystal formations – a result of dripping water. You need to climb a couple of steep, slippery stairs before you reach the main entrance. On the way you will be asked to pay 40 Baht towards the electricity. 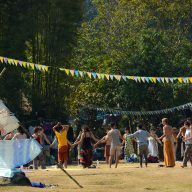 The caves are treated as sacred places, so wear decent clothes – no short sleeves, no skirts nor shorts. If you happen to wear something inappropriate you can rent a scarf for 20 Baht. There are two small shrines at the entrance. Once you pass the second shrine you cannot go any further without a guide. The caves are poorly lit. 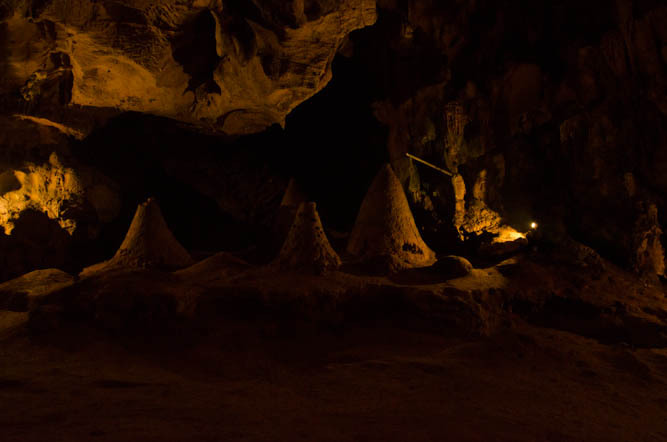 Only the chambers with impressive stalagmites and stalactites have one or two lamps, which only give a little bit of light. 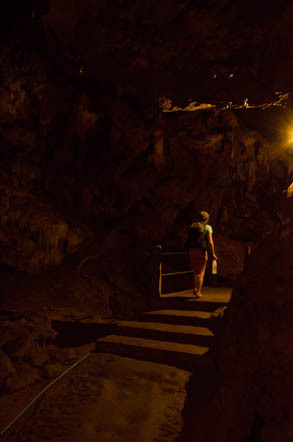 The rest of the caves are completely dark and you do need a guide to explore them. There is a 100 Baht fee for the gas lantern and another 100 Baht for the guide, which is paid at the end of the trip. You will be told that the guide are volunteers and asked for a donation. It is up to you if you want to pay it, but I must warn you that the ‘donation’ is expected, not recommended and it is better not to argue with the guides. 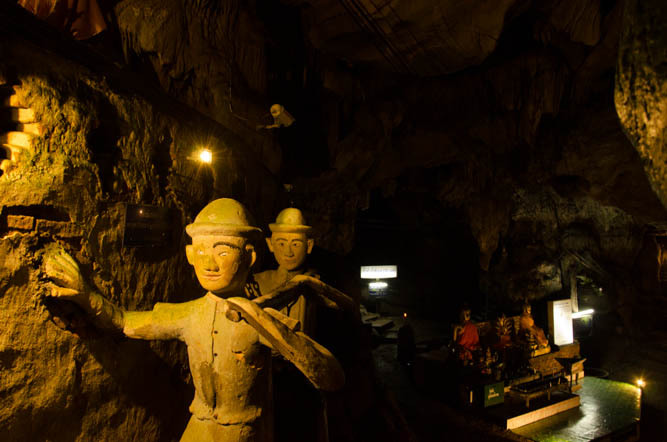 The guide will take you to see the Tham Ma, Tham Kaew and Tham Nam caves, which are over 500 meters under the ground. Some passages are very narrow and once or twice you will have to crawl through some small spaces. The caves are definitely not recommended for those suffering from claustrophobia. 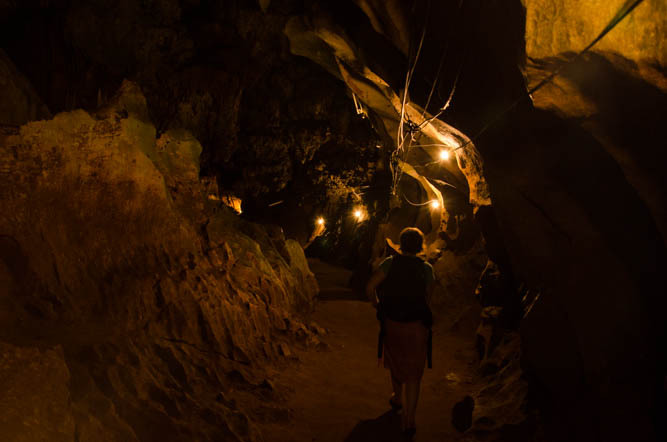 Once you get back to the entrance you will have a chance to walk through the Tham Phra Non cave, which is lit up and safe enough for you to explore by yourself. The outside of the cave is well maintained. It has a little pond, with blue water and colourful carps that you can feed (Buddhist believe this brings a better karma). If you turn left from the pond and head towards the toilets you will stumble upon a little temple. 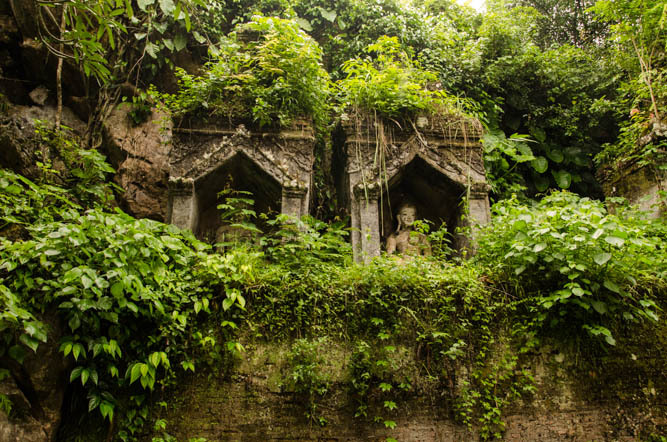 Behind it there are some ancient, neglected Buddha statues, which are slowly being covered by the vegetation. There is also a new golden statue, which was built recently at the foot of the mountain. 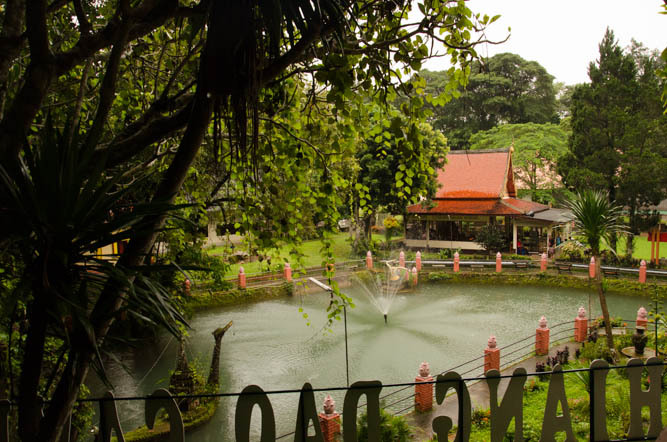 Chiang Dao is located in the Northern Thailand, around 2 hours drive from Chiang Mai. 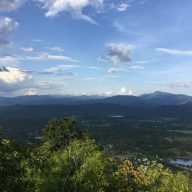 You can take a bus there (the local buses leave from the northern bus station in Chiang Mai), or drive a motorbike. The road is straight and it is impossible to get lost. 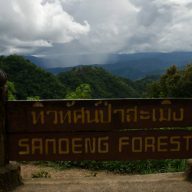 From Chiang Mai drive towards Mae Rim and follow the road number 107 all the way to Chiang Dao. After driving past the tiny town centre you will see a big sign telling you to turn left. Follow the road for another 5 km until you reach the caves. A warm jumper: The caves are sometimes very cold, but can be also hot and humid. It is good to take something you can always quickly put on, or take off. Good shoes: Flip flops are not recommended. Sandals, trainers or any other shoes that can give you a good grip on a slippery surface are much better. A bottle of water: The sightseeing is not that long, but it is better to take some liquids with you, in case you get too hot. A torch: Some people find it useful. The guide will have a lantern with them, but they can’t be at your side at all times. Opening times: 07 am – 05 pm.